Is Your AC Sized Properly? When homeowners think about air conditioners, they either ignore size and cooling power or think that bigger is better. In reality, when you're choosing an air conditioner, you should pretend you're Goldilocks and find one that's just right. The fact that an air conditioner that's too small is no good easily makes sense to most people. It will run forever but won't have enough power to cool your home on a hot day. At the same, your electric bill will shoot up from the nonstop use. Even if you can save a little on the purchase price with a smaller AC, this is obviously a bad option. An air conditioner that's too big will cool too quickly. Here's why you want to avoid this. Rooms farther from the AC take longer to cool. An oversized AC will often cycle off before cool air can even reach them. An AC's second job is to remove humidity, and it needs to run for a while to accomplish this. If it always quickly cycles off, the inside of your home will feel damp and uncomfortable. An AC that constantly turns on and off will wear out faster and need to be replaced sooner. 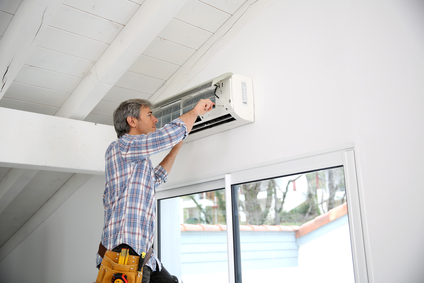 Below are some of the common reasons an air conditioner might be improperly sized. Installed by original builder. If your home was part of a cookie-cutter subdivision, there's a good chance the AC wasn't properly sized. Often, the builder may take a one-size-fits-all approach throughout the country without considering local weather or conditions unique to each individual home, or they may just be looking to cut costs by installing undersized ACs. Home renovations. Have you added a room, removed a wall, or installed new appliances (maybe a washer and dryer in a home that didn't originally have one)? Your home's heating and cooling needs may be greater than they were when your AC was originally installed. Exterior changes. Changes to the inside of your home aren't the only things that affect your cooling load. Adding or removing large shade trees, having a building go up next door, or adding exterior features like awnings or a porch can also change your cooling needs. You don't need to replace an improperly sized air conditioner right away, but lost efficiency may make you want to replace it sooner than you normally would.